FRESNO, Calif. (KFSN) -- The non-profit group Bless You Inc. delivered four fully equipped trailers to be used by families who lost their homes in the Detwiler Fire. According to Mariposa County, Bruce, a retired firefighter who lives in Southern California, saw the details of the Detwiler Fire on the news. 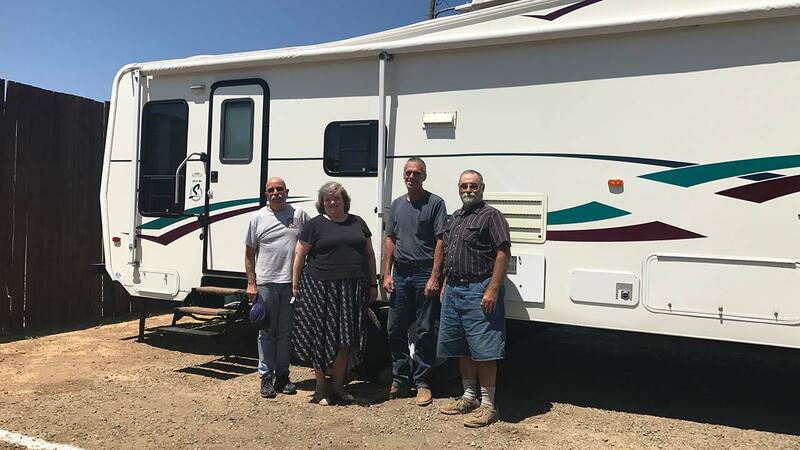 He reached out to Mariposa United Methodist Church and offered the services of Bless You Inc. a short time later, the organization was on the road to Mariposa with the trailers. Bless You Inc. is a non-profit group that provides trailers to victims in the wake of natural disasters. According to their website, they have 18 travel trailers around the U.S. that come fully stocked with bedding, toiletries, food and water. Local churches and organizations keep the trailers stocked and families can live in the trailers as transitional housing for up to a year. If you are in need of housing due to the Detwiler Fire, please contact Amy Woodward at 209-966-2000. For more information on how you can donate your travel trailer to this cause or learn more about Bless You Inc. you can visit their website at www.blessyouinc.com or you can call them at (712) 260-0414.